Bill and Lynda Williams, Mechanical Fitter and OR Nurse. 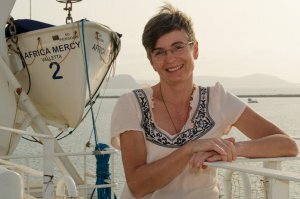 When operating theatre nurse Lynda Williams learned about Mercy Ships providing free essential surgeries provided to Africa’s poor, she was immediately engaged and interested in volunteering. 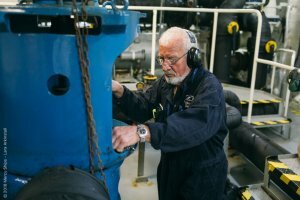 What came as a big surprise was that her husband Bill’s trade skills were also in high demand on the hospital ship and they loved the idea of serving as a husband and wife team. 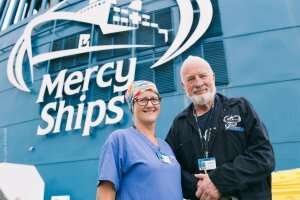 Lynda was rostered on duty in the vessel’s six operating theatres. 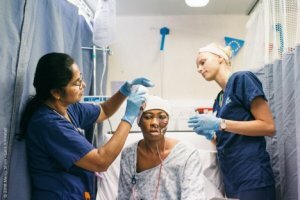 Her surgical teams performed tumour removal for large benign yet often life-threatening tumours, and more recently ophthalmic surgery for patients of all ages. ‘The last two weeks I contributed to the healing of people of Guinea who are blinded by cataracts by scrubbing every day in the eye theatre. Although the hours are long, and some of the cases are all day long, the crew we work with are great – surgeons and anaesthetic people even helping to mop the floors, take out the rubbish and saying thank you often! 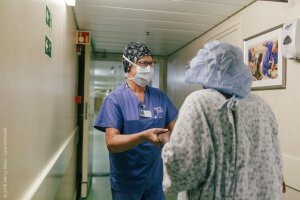 OR Nurse, Lynda Williams, leads an eye patient out of the OR. The six- and eight-year-old sisters didn’t get the important nutrients they needed during crucial years of bone development. Without strong bones, the pressure of walking caused their legs to grow incorrectly, resulting in a condition called Valgus. Because of their malformed legs, they both found it difficult to walk to school, and only sometimes managed to attend. Their malnutrition, combined with an inability to access surgery, meant Salamatou and Mariama had to learn to cope with their twisted legs. Mymoona was so worried about her daughters that it began to take a toll on her health. 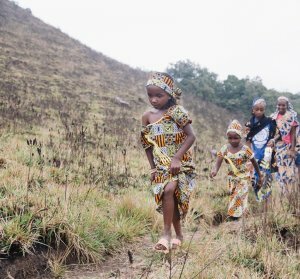 So when her husband, Debo, heard about Mercy Ships, he led all three of his girls down the mountain on horseback, making the brave journey to the coast. 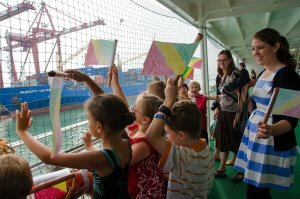 They were grateful to have each other as they arrived at a ship they had only heard stories about. Salamatou and Mariama, sisters, walking with their family near their village. The sisters’ almost identical conditions enabled the whole family to stay together after they were approved for surgery. With their family by their side, Salamatou and Mariama began to soak in their new surroundings and prepare for the operations that would change the course of their lives. 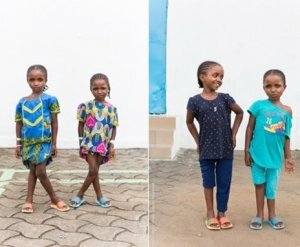 The first day after their surgeries, Salamatou was up and walking around, challenging her sister, who was convinced the straightened casts didn’t contain her own legs. Clutching at the familiarity of her toes, Mariama watched her older sister stand tall. Soon, their strong personalities were evident as they each watched competitively to see what the other was achieving. During their rehabilitation exercises, their parents learned about the importance of nutrition. The ship’s dietician gave them valuable information about crucial nutrients, like calcium, before sending the family on their way with plenty of vitamins to aid the girls’ healing. Volunteer Physiotherapist Meg Crameri worked with the girls during their rehab sessions. She hopes this nutritional advice will be shared to help other families whose children might otherwise end up suffering with similar conditions. 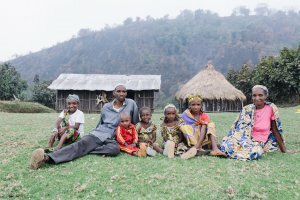 Salamatou and Mariama’s family in their village. Salamatou and Mariama returned to Bororos with newly straightened legs! And Debo and Mymoona returned ready to share what they had learned about nutrition during their time on the Africa Mercy. It all started with a toothache when Salematu was 24. As a first-year nursing student, she knew she should go to the dentist, but she was struggling. She had just lost her husband unexpectedly, leaving her with two young daughters. Money was low, and medical costs were high. But the pain in her mouth grew worse. Eventually, waiting was no longer an option. After examination, the doctor’s news was not good — she was told it was a tumour that was growing slowly but steadily. Over the next two years, she watched helplessly as it took over her face, pressing into her mouth and making it more difficult to speak or swallow. It twisted her nose. It began to creep closer to her left eye, threatening her vision. All the while, Salematu was told the same thing by doctors: there was nothing they could do. They did not have the medical capacity to help her. Over time, she was forced to abandon her dream of finishing nursing school. What use was it to continue studying if her tumour kept her from working? Tired of the looks and comments from strangers in the street, she stopped going out. She became relegated to her home, spending most of her time with her two young daughters. She was ashamed to be seen, embarrassed to let even her daughters witness her changing face. “I felt helpless. I shouldn’t look like this,” she said. 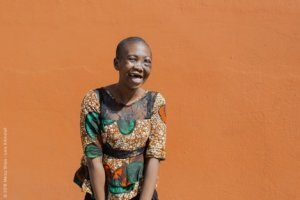 The first glimmer of hope came the day her uncle called her with news from the port city of Conakry — a hospital ship was arriving to perform free surgeries! Her heart was filled with happiness at the hope of release from the tumour. Salematu got on a bus and made the journey to the capital city alone, leaving her daughters behind with their grandmother. It was hard to say goodbye not knowing how long it might be until she saw them again, especially without a way to keep in contact. But she knew that this surgery would not only save her life — it would save her daughters from growing up as orphans. The day she walked up the gangway to receive her operation, Salematu said she felt joy down to her bones. After a few days, she was able to look into the mirror and see her new face for the first time after surgery. “I feel beautiful. I feel good. I feel hopeful,” she marvelled. 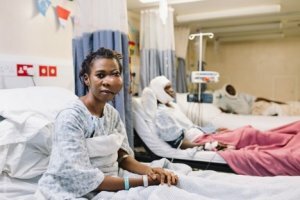 During her stay on the Africa Mercy, Salematu couldn’t stop thinking about the moment she would be reunited with her daughters, when they would finally see her without the tumour that had hindered her smile for two long years. Without a way to send them photos, she knew the transformation would be overwhelming. Friendly nurses kept monitoring her progress. She was moving closer to the finish line — the countdown had begun. The day she was told she could return home, Salematu said she felt like dancing! She was so excited to finally hold her daughters close, and to return to pursuing her dreams of finishing nursing school, with the hope of one-day pouring love and care into others. These plans for a life that once felt powerless now felt full of limitless possibility. Salematu’s miracle changed her life, and she couldn’t wait to share her joy with the world.